Go home with a unique souvenir thanks to this 60-minute pottery session in Tokyo's tree-lined Omotessando neighborhood. 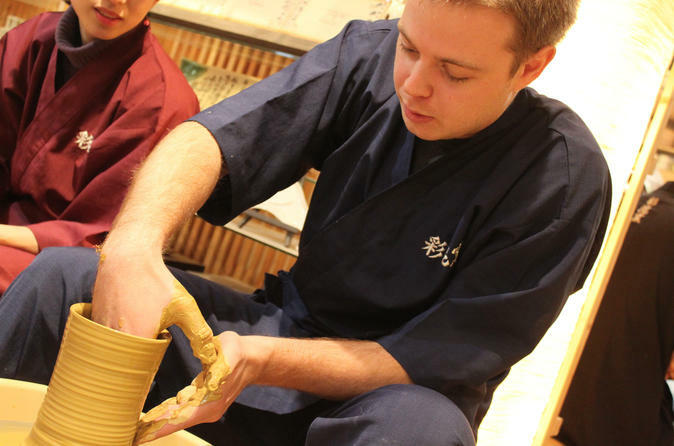 Wear a 'samue,' traditional clothes of a Japanese craftsman, and learn how to make hand-crafted pottery, as a professional pottery instructor guides you along the way. Choose between making a ceramic cup or a chopstick-rest. After the session is done, leave with your awesome new souvenir. Experience the traditional Japanese art form of ceramics during this 1-hour class. Put on a samue, a traditional outfit that Japanese craftsmen wear, and learn how to create a Japanese-inspired ceramic piece. Choose to make either a cup using an electric pottery wheel or try a hand-mixing method to create a chopstick holder. Take home a pre-made cup from the studio, as standard kilning time can take many weeks. Bring your handcrafted cup home packaged in authentic a paulownia box. Pickup your chopstick holder before returning home, kilning time is only 3-hours. Transport your souvenir safely in an acrylic box provided by the studio.